In business for over 55 years, Climet has dozens of multi-jurisdictional patents in the field of particle counting. The CI-90A is fully compliant with ISO 14698, PIC/S; FDA CGMP; EU GMP, Annex 1; 21 CFR Part 11, and others. The CI-90A has a stainless steel enclosure with an built-in thermal label printer. It is an active air microbial sampler used in either sequential or continuous monitoring applications in aseptic areas. The CI-90A is able to accommodate either industry standard 90 mm petri dishes, or RODAC plates; and is available in either 25 LPM, 1 CFM, or 100 LPM flow rates. The lower flow rates of 25 LPM or 1 CFM are recommended for continuous monitoring applications. Testing has confirmed that up to 3 hours (possibly longer) of continuous sampling with a custom agar fill of 40mL in a 90 mm petri dish is possible. Independent validation is recommended. The Climet CI-9xA Series of microbial samplers is designed and built with the same ruggedness users have to come expect in Climet particle counters. It is the only pharmaceutical grade microbial air sampler that meets and exceeds all requirements AND recommendations of ISO 14698, as well as augmented by some requirements in ISO 21501-4. The CI-9xA series of portable microbial samplers is VHP compatible. A long-earned reputation in the industry for manufacturing high efficiency microbial samplers, our CI-9xA series have been tested to confirm excellent physical and biological efficiencies. Additionally, repeatability of measurement studies have been conducted, which statistically confirm a "near perfect linear relationship." This Repeatability Study is unique in the industry, and is yet another way Climet exceeds testing required by ISO 14698. High quality materials, an expert level of engineering acumen, and a mature DFM (Design For Manufacturability) enhances product life cycle, offering users a decade or more of reliable operation. In manufacture since 2004 (over a 13 years), there has not been one report of a CI-9xA microbial air sampler being out-of-tolerance during its interval calibration. These are but a few factors that greatly enhances Climet's reputation for providing the lowest TCO (Total Cost of Ownership). End users in regulated industries, and others of discerning taste for high precision instrumentation, exclusively sole source Climet as their preferred solution provider. Customers in regulated industries are generally required to re-calibrate their microbial sampler annually. Depending on the process or risk assessment, the CI-9xA series of microbial air samplers may be calibrated at six month intervals, or even more frequently. When a microbial sampler is out-of-tolerance (OOT) during the interval calibration, a deviation report and investigation is required in regulated industries. Among pharmaceutical and biotechnology producers a simple failure investigation (assuming no batch rejection) costs between $8,000 to $12,000 on average. This cost is difficult to calculate as it's almost all labor and usually involves multiple departments. It is a hidden Cost of Poor Quality (CoPQ) associated with the instrument, which few end users track. As the cost of one simple failure investigation well exceeds the initial purchase price of a microbial sampler, we can conclude that CoPQ is the #1 cost driver. Climet's CI-9x Series is fully compliant with ISO 14698-1, and is one of the few, if not only microbial air samplers that meet or exceed every requirement and recommendation of the standard. Some non-standard models may be subject to extended lead time. Please, call for further details. Exceeding standards and expectations. 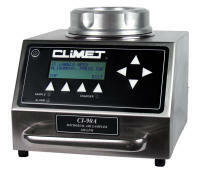 Climet uniquely manufactures our instrumentation, not to simply meet ISO 14698 standards, but to exceed the standard in order to meet user expectations for: (1) accuracy and stability of measurement; (2) mitigation of deviation reports and investigations; (3) ease of use; and (4) overall product quality. These factors uniquely provide our loyal customers the lowest TCO (Total Cost of Ownership).